In my current role as Student Success Librarian I am constantly on the lookout for new ways that provide evidence of our instruction efforts. The challenge in this is the need to produce and manage data that highlights students’ understanding and application of the information literacy concepts we are teaching. Given the current shift in assessment methods in library instruction performance based assessments are our best bet. Performance based assessments, “reinforce the concept that what students learn in class should be usable outside the classroom,” and provide students the opportunity to “make sense” of the how the research process and library resources work together (Oakleaf 2008). The trick is identifying useful ways to turn these assessments into trackable data. That is where online tutorials, specifically Springshare’s LibWizard platform have been extremely beneficial. LibWizard is a “feedback and assessment” platform that allows creators to create tutorials, quizzes, surveys, and forms. For our instructional assessment purposes we used the tutorial function of the LibWizard platform. The LibWizard platform provides a wealth of resources that allowed us to create an interactive tutorial that included embedded live webpages, videos, instant feedback, and multiple question types. Ability to adapt the quiz tools to show performance-based understanding of specific information literacy concepts. Historically our Dental Hygiene program has conducted any library/research instruction online due to a tight curriculum schedule. Previously instruction was offered through a static LibGuide and assessed through a multi-choice quiz developed using Google Forms. This created several issues from an instruction and assessment standpoint. The static nature of the LibGuide limited students engagement in the material, and the assessment tool did not provide any insight into the students’ ability to apply their understanding of the content being covered. Using multiple platforms also created reporting logistic issues. Adapting and updating the content into an interactive online tutorial enabled us to provide us several beneficial opportunities. The first was to create an assessment tool that allowed students the flexibility to repeat the tutorial as many times as necessary to reach the 80% required by the faculty member. This repetition also allowed students the chance to review concepts they may not have fully grasped the first time it was covered, a concern for many dental hygiene students whose first language is not English. The framed-based tutorial design of LibWizard allowed us to provide the content (embedded website, video, pdf, etc.) on one side and the assessment on the other. This structure served our needs to create something that engaged the students to put what they were learning into practice. For example, one frame or “slide” was dedicated to students’ understanding of the library’s discovery tool. While a couple of the questions are multiple choice, they are tied directly to the student’s ability to accurately use the library resource, meeting the performance-based assessment requirement. An unexpected benefit to using LibWizard as our assessment tool for this class has been our ability to track students’ retention of information literacy skills and concepts through the platform’s robust data tracking features. Students enter the dental hygiene program in cohorts, which presented us with the opportunity to track the same group of students through a set of classes. While only one of the classes required the students to complete the tutorial for a grade, the next semester’s class highly encouraged students to complete it again. The data collected through LibWizard provided the faculty and myself the chance to see what information the students retained and what areas they may need a refresher or additional information on. This analysis of the students’ results also gave me constructive insight on how to improve the tutorial for the 2018/2019 school year. For example, a question regarding citations was consistently missed in both semesters. After making note of this and discussing it with the faculty, we quickly determined that the wording of the question and possible answers was likely causing some confusion. While the results from the 2017/2018 have proven promising, we are waiting to collect the 2018/2019 data to determine if this new approach will have been more impactful than the previous static method. LibWizard has proven itself to a valuable resource in our online learning toolbelt. The platforms do have their shortcomings, but with the some creative MacGyvering and support from Springshare we have been able to make it meet our needs. 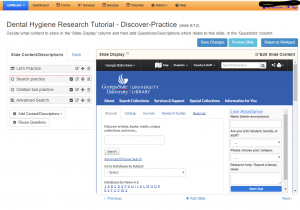 How would you use this new platform to enhance your institution’s instruction program? Oakleaf, M. 2008. Dangers and opportunities: A conceptual map of information literacy assessment approaches. portal:Librarianship and the Academy, 8 (3)., 233-253. Instruction and online learning instruction, online tutorials, Springshare. permalink. What sort of shortcomings did this platform have?